Hot tramp, I love you so! Rebel Rebel Heart Skull by Ron English is back with an iconic new paint job! Whether you’re a Jean Genie or The Prettiest Star, this piece will definitely make a wonderful addition to your collection. 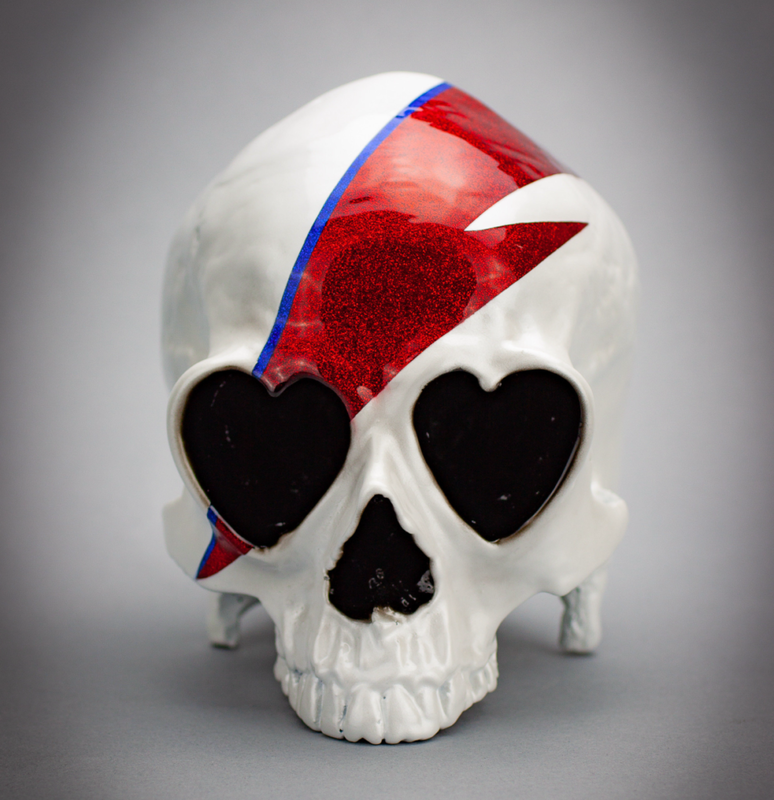 Limited to five pieces of hand poured, hand-painted roto-cast resin, Clutter Studios have worked with Ron English to create this macabre, Bowie and Pop Surrealism Rebel Rebel Heart Skull. Custom painted to pay homage to 1973’s Aladdin Sane. Priced at $400 (£309) each. They’ll be available to purchase this weekend at Five Points Fall Fest in NYC. A weekend of Five Points Fall Fest fun takes place on 5-6th October in NYC with the guys that joyously brought us Five Points Festival. 7pm: UK based street Artist CZee13 and Andrea Kang are live painting a 4ft Dunny. Have a beer on us while you watch these two talented artists work! 8pm: Munny live drawing with Droldan, Cat Atomic, and more! All Night: Live drawing by Grace Lang, SMURFOUDIRTY and foxxfaces! All Night: Music by DJ Supra, Beer fueled by our friends at Lagunitas! and AWESOME GIVE AWAYS!! If you’re not heading to NYC for Five Points Fall Fest (or NYCC), why not sling some support towards The Toy Chronicle and purchase a Five Year Tee, Print, TTC Skull or Sticker from our new TTC Five Year Collection, celebrating our FIFTH birthday. Check it at the image below….